Research and innovation are at the heart of Saint-Gobain’s strategy. The Group supports the development of sub-Saharan Africa by providing a range of services and solutions tailored to local demand. The Top 100 Global Innovators programme identifies the most innovative companies and research structures. Since 2010, Saint-Gobain has consistently been recognised as one of the 100 most innovative companies in the world among Thomson Reuters’ top 100 Global Innovator Companies. The Saint-Gobain Gyproc Research and Development department is located in Brakpan, about 50 km south of Johannesburg (South Africa). Saint-Gobain always strives to meet market needs. The Research and Development department assists marketing teams with product evaluation and development as well as with adapting systems to local needs. All the new products developed need to achieve high standards of performance in terms of ease of use, comfort and wellbeing for the end user. They also need to meet life cycle analysis requirements (i.e. no negative impact on the environment). Raw material sourcing strategies are critical to the business. The Research and Development department supports the business through chemical analyses and material testing during the evaluation and qualification of new or alternative raw materials for use in the plaster and plasterboard manufacturing processes. The impact of the extraction, source and use of these raw materials on the environment is assessed at the same time. Operations and process optimisation aim at minimising the cost and use of resources as well as maximising the throughput and/or efficiency of the manufacturing process. The Research and Development team delivers technical support to the plant process teams during product trials and process optimisation projects. Since 2015, Saint-Gobain has been reinforcing its presence in sub-Saharan Africa. To accompany Saint-Gobain’s development in the region, the Research and Development department also supports activities in the Saint-Gobain Gypsum plants in Zimbabwe and Tanzania, through raw material analyses, product testing and plaster formulation development. Located in Alrode, about 20 km south from Johannesburg (South Africa), the Saint-Gobain Weber Research and Development department was founded in 2013. Its work is focused on tile fixing, flooring, technical mortars, ETICS (External Thermal Insulation Composite System) and facades. Saint-Gobain Weber solutions are developed through extensive research and development and are subject to strict quality control procedures. Quality compliance, environmental impact and technical assistance. The local energy crisis has placed the focus firmly on developing new cost-effective and high-efficiency insulation solutions for the technical and building markets. These products provide customers with solutions that enable them to meet and exceed the increasing requirements of legislation, with ever-increasing levels of comfort and energy saving. Working closely with Saint-Gobain’s international research and development teams, the local teams have developed leading solutions for the widest possible range of technically demanding insulation requirements. In future, Saint-Gobain Isover plans to launch a glasswool solution that will deliver excellent performance and improved installation comfort, will be more environmentally friendly and will improve health and wellbeing. 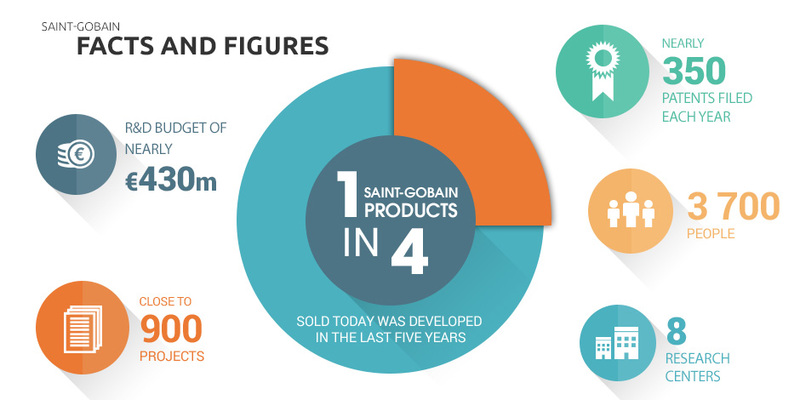 At Saint-Gobain, 1 product in 4 sold today was developed in the last 5 years.